Our corporate responsibility management system consistently implements our CR strategy within the company. To achieve this, we have set up an appropriate organizational structure. 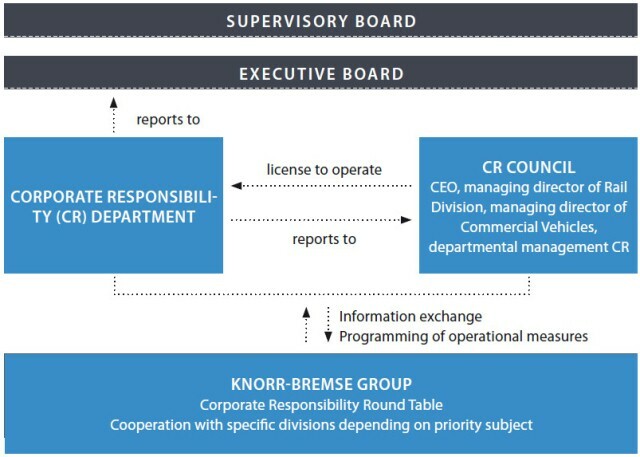 Knorr-Bremse has created the CR Council as a discussion and decision-making body. 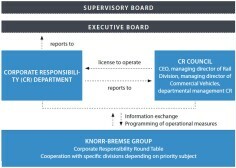 It is composed of a member of the Executive Board, two representatives of top management in the two corporate divisions, the chair of the charitable association Knorr-Bremse Global Care and the Head of Corporate Responsibility department. The CR Department is responsible for identifying relevant priorities, defining objectives and deriving specific measures that are implemented in conjunction with the specialized departments. Ultimately it is the business areas that are responsible for successful implementation of CR projects. Raising awareness of CR issues among employees and promoting their knowledge of sustainability objectives and activities are a fixed part of our CR commitment. In-house presentations and articles in employee magazines provide information about specific activities, and new employees are trained in Corporate Responsibility. 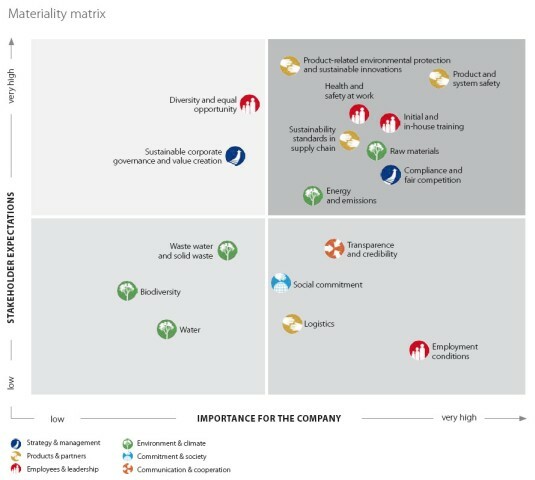 So that ecological and social aspects can be integrated into corporate processes, their importance is analyzed from the point of view of our sustainability objectives and revised if necessary. For example, we have incorporated the principles of the UN Global Compact into the Group’s procurement structures. 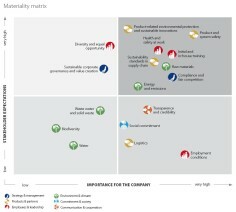 Knorr-Bremse uses a materiality analysis to help decide on the areas in which the company can meet its responsibilities.The review pinpointed the issues of importance for the long-term success of Knorr-Bremse and the Company’s stakeholders in view of current environmental and social challenges.